Twenty-eight years ago I was diagnosed with black melanoma and given 6 weeks to live. Since then I have had hundreds of phone calls from people who have heard that I had cancer and they wanted to know how I cured myself. They want to know - where do I get all my energy and enthusiasm? My book Why Me? 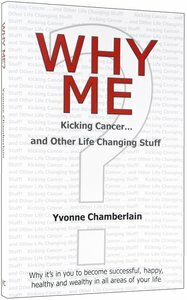 Kicking Cancer and Other Life Changing Stuff ^is about how I changed my attitudes, my thinking, my relationships, my marriage, my time management, my diet, my exercise, and my nutritional supplementation. It is about holistic living and being wealthy in every area of your life. My book tells you how to overcome the obstacles that cause your immune system to become defunct, and how to get control of your life so that you have the energy to really live and enjoy every moment of your day. Dr John Tickell, well known for his forthright and inspiring role in the top-rating Australian TV show Celebrity Overhaul has endorsed the book. I hope that you find the book inspirational, challenging and helpful, not just in recovery from disease, but for your whole life and in every area of your life. The book is not just for people who have a sickness; it is for everyone who wants victorious living, about becoming who you can be and not wasting a moment of LIFE. When you have had a "death scare" you appreciate every extra minute you have been given. Life becomes very precious. Enjoy. Yvonne Chamberlain's life was in a mess. Her marriage was on the rocks and then she was given six weeks to live. But twenty years on ... with a little humour and lots of insight, Yvonne, now popular on the speaking circuit, shares her thoughts on how to: Evaluate the important things in your life and business - Motivate yourself to your potential - Live from the inside out - Harness your most precious possession - self mastery.